Hidden Flask - Sunscreen and Tanning Lotion Set - Includes 2 8oz Tubes, Funnel, 10 Seals, and 1 Free 32oz Cruise Flask (Sunscreen and Tanning Lotion Set) by Cruise Flask® at My Natures Treasures. MPN: MORR100TS. Hurry! Limited time offer. Offer valid only while supplies last. SNEAK ALCOHOL ANYWHERE, AND SAY NO TO OVERPRICED DRINKS! GOING ON A CRUISE? Do you want to avoid the outrageous cost of Alcoholic drinks on board? These Heavy Duty Reusable and Concealable Tubes of Sunscreen and Tanning Lotion for Booze & Cocktails will allow you to enjoy your vacation a lot more. This Kit created by CRUISEFLASKÂ® is perfect for sneaking your liquor onto any cruise ship, inside your luggage. Now you can have fun without breaking the bank on booze. So, go ahead, and pack a CRUISEFLASKÂ® Kit loaded with your favorite beverage. 1.- Wash tubes and flask with soap and water, rinse thoroughly, inflate flask with a puff of air, turn upside down with cap off, and let dry. 2.- Use funnel to fill Tubes and Flask. 3.- It is recommended to remove and discard the O-Rings from the Flaskâ€™s caps, and twist the caps as tight as possible to avoid leakage. 4.- Do Not Fill With Carbonated Beverages. 100% ORIGINAL CRUISEFLASK¨ Brand - SAY NO TO CHEAP IMITATIONS! 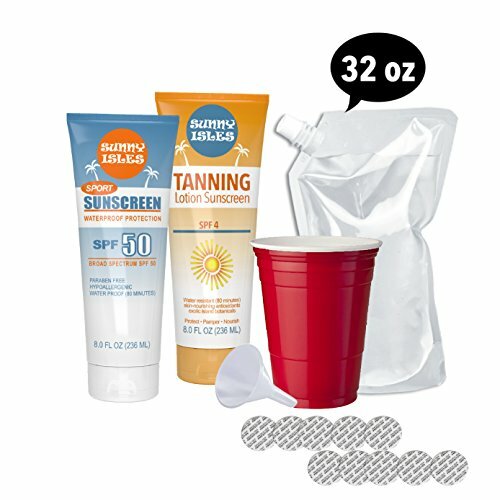 Kit includes Two (02) 8 oz Flasks disguised as a Sunscreen and Tanning Lotion tube with leak-proof flip top caps, and one Funnel for easy filling, plus a FREE 32 oz Genuine CruiseFlask, and 10 adhesive press seals for extra protection. SAVE MONEY: Save lots of money on your next vacation, and bring your alcohol with you!